I'm sitting on my couch eating cookie dough and thinking about the impending darkness of Lent. When I first converted to Catholicism I LOVED Lent. It was my favorite liturgical season. Today I get tired just thinking about the sacrificial lengths I went to then. I couldn't get enough of the privation before the feast, and I would make lists and lists of self-denying, soul-ennobling activities. 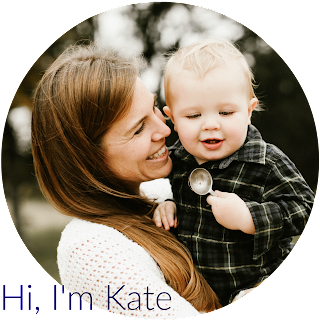 Now, a few years in, I've calmed down a lot - maybe the cool Catholic kids will finally start hanging out with me. I was pretty chill last Lent. I think my primary sacrifice was avoiding Jacob's and my "signature fight." I don't know if every couple is this way, but it didn't take long for me to realize that Jacob and I only had one real fight - we had it over and over again to be sure - but it was always the same one. It always boiled down to a central issue. So last Lent my goal was to avoid the triggers to this fight. It was a really rewarding experience, chock full of lip-biting. I'm currently trying to think of a similar sacrifice for the impending lenten desert and simultaneously devouring the cookie dough in case said sacrifice happens to involve sugar or chocolate or...raw eggs. We went to a supremely awkward Mardi Gras at church this evening. We are constantly hopping between two parishes here in LA. One is in Beverly Hills and has a lovely choir and the other hosts Jacob's Knights of Columbus chapter. The two parishes have rivaling Mardi Gras parties. The Beverly Hills one is tripping with all kinds of cool. It's filled with young-ish people and lasts until the early morning hours, mountains of crawfish and cocktails. But the Knights...well at the Knights' party the florescent lights stay on in the parish hall. The forty people in attendance offer a median age of around 70. The jazz band is decent but almost everyone leaves during the band's first break and people start cleaning up. The band returns to about three elderly couples who unabashedly rule the dance floor for the last set. The dessert table is filled with lemon flavored bundt cakes. And it's perfect. I love it so much. And that's where we were tonight. Jake was adorably mellow throughout the evening since it was way late for him. He sat in my lap and watched the band for about fifteen minutes, and that is a toddler record for him by far. 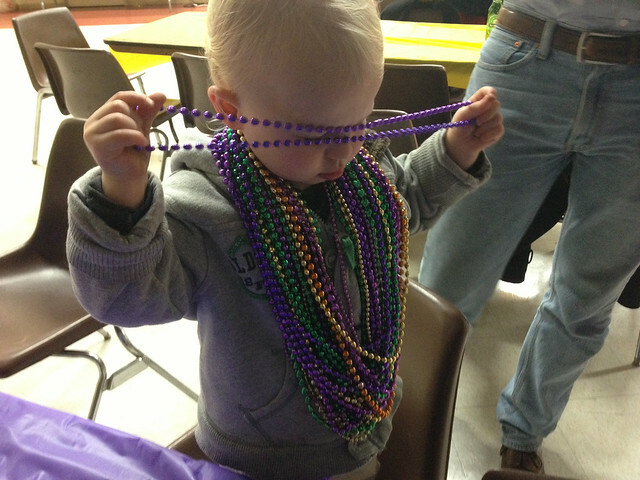 One sweet little lady introduced him to the joy of Mardi Gras beads and he adorned himself with every strand he saw. It was adorable, and Jacob and I shamelessly played parent paparazzi as he pulled necklace after necklace over his little towhead. Jacob has spent the last half hour moving the beehives about fifteen feet away from their current location - at our landlord's insistence. It's unwise to move hives in such close proximity to their old location because the similar surroundings cue them to head to their old spot instead of acclimating to their new one. Even though it's dark and most of the bees are in the hive, a few minutes ago, so many lost bees were attracted to the light in the living room that it sounded like rain hitting the windows. So I turned off the lights. And now I'm blogging in the dark. But I must go because Jacob is insisting that I come "take care of him." He guesses he got stung about fifteen times and even feels a sting on his "buttox." Happy Mardi Gras but an even more blessed Lent. I only just found out a couple days ago that Ash Wednesday was THIS Wednesday. I haven't been properly binge-eating! I suppose I'm old enough to start preparing for Lent in a more serious, less frivolous manner. I LOL at that last comment. And I totally agree. As a newbie to the church, I still forget about Friday's. I hate fish. I whine and whine and whine a lot. And I never remember what I gave up until I have already messed it up. Argh. This year I am going to try the purposefully do something good instead of sacrifice something I won't remember anyway! Happy Ash Wednesday, to you!